. ببساطة كل الخدمات وأساليب الضيافة التي تشتهر بها Best Western International تجعلك تشعر وكأنك في بيتك. هذه بعض الخدمات الموجودة في هذا الفندق: خدمة الغرف على مدار الساعة, واي فاي مجاني في جميع الغرف, أمن على مدار 24 ساعة, خدمة التنظيف يوميًا, خدمات بريدية. في الفندق غرف نوم يتجاوز عددها 73، كلها مجهزة بعناية وجمال وبعضها مزود بـ تلفزيون بشاشة مسطحة, اتصال لاسلكي بالإنترنت, اتصال لاسلكي بشبكة الإنترنت (مجاني), حوض الاسترخاء, غرف لغير المدخنين. كما أن مجموعة الخدمات الواسعة الموجودة في الفندق لضمان راحتك تترك لك الكثير من الخيارات لقضاء وقتك أثناء فترة إقامتك. اكتشف مزيجاً ساحراً من الخدمة الاحترافية والخيارات الواسعة من وسائل الراحة والمتعة في Best Western Plus Buckingham International. 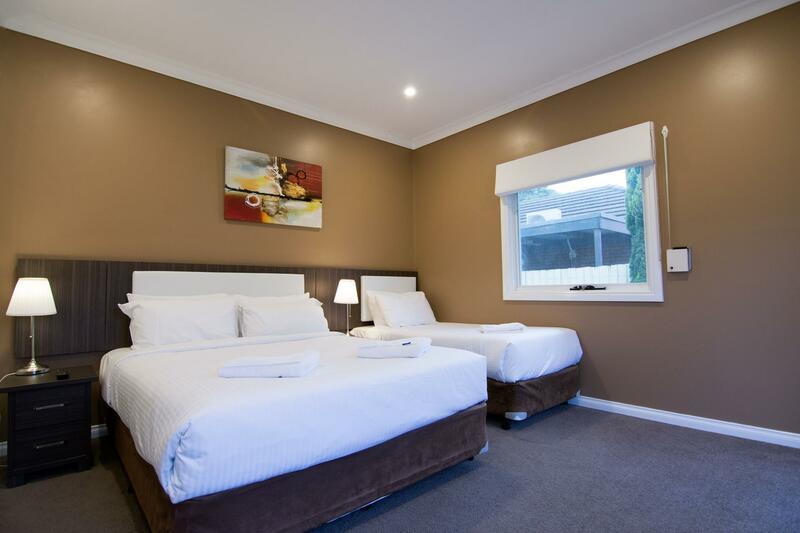 Located on Nepean Highway conveniently situated 25mins from city and only few minutes drive to great beach locations. if you dont have car, train station just a 5 min walk. 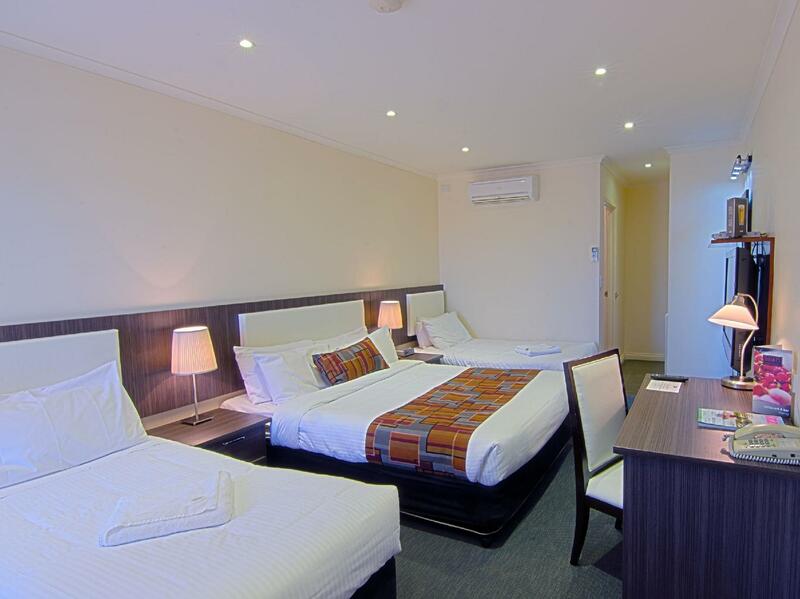 Rooms are clean, tidy and well maintained with pretty much all that you expect in this type of accommodation. Would stay again. Very happy with the accommodation. Would definitely return. Staff were all very helpful and pleasant. Great location for where we needed to go. Over all cleanliness was excellent we were upgraded to a spa room but the spa although clean wasn't sparkling. I'm a cleaner of tourist accommodation and am very fussy. Dear Wendy, Thank you for taking the time to leave your honest opinion, we appreciate all feedback. It is so lovely to know you had such a positive experience with our staff. I am glad the location of our property was convenient to your stay. I'm sorry to hear your spa was not sparkling clean, but I thank you for letting us know so we can look into this issue further. We look forward to welcoming you in the future. Kind Regards, Front Office Management. Plenty of parking space. They have welcome apples at reception :) The room was big. Nice gym. The hotel is located in the suburb area which is a bit faraway if you want to visit the attractions in the city or go to the airport. The floor in the room was very cold. Anyways, I and my family enjoyed our stay here. Dear Peniga, Thank you for taking the time to leave your honest opinion, we appreciate all feedback. I am glad to see you had a positive experience with us, and enjoyed our welcome apples! 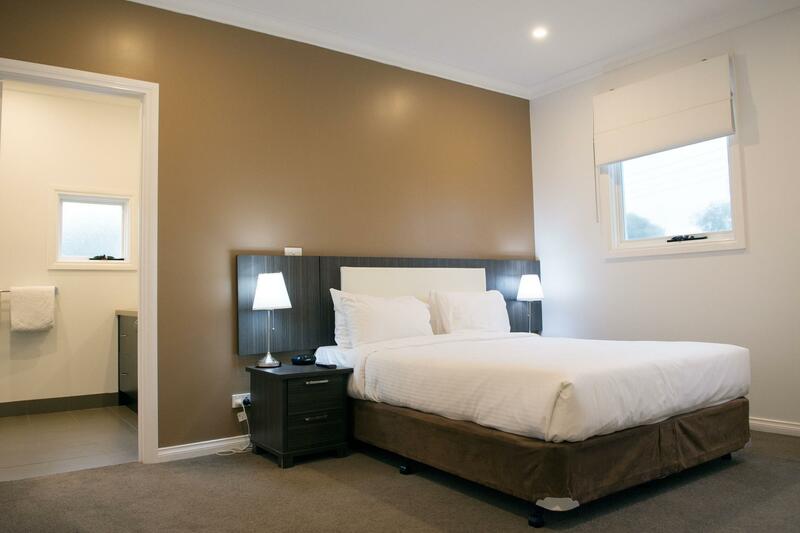 We are situated 5 minute walk away from Highett train station which takes you straight into the city in just over 30 mins. I'm glad you & your family enjoyed your stay. We look forward to welcoming you in the future. Kind Regards, Front Office Management. 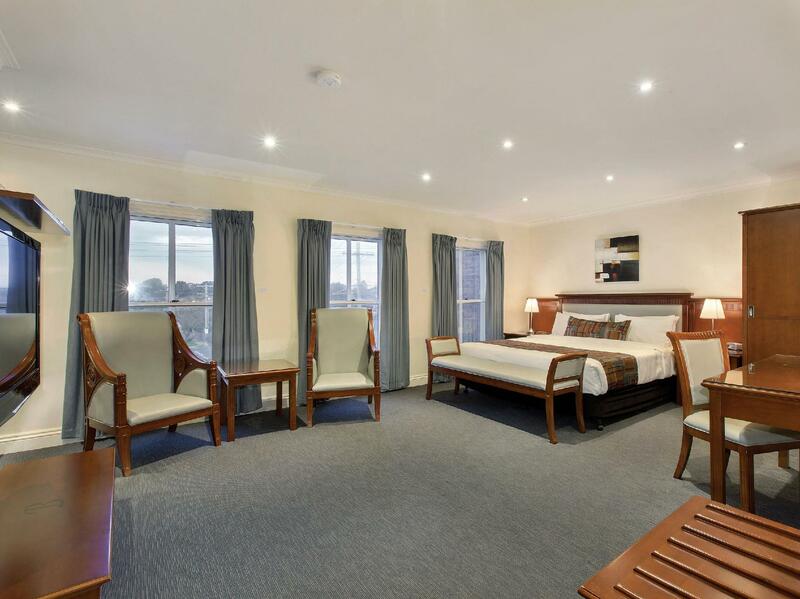 We really enjoyed this hotel as an option for our group who was attending a wedding only 10min down the road at Mordialloc. We were pleasantly surprised to find a lovely outdoor cafe/bar area where we had some drinks between the ceremony & reception and a really lovely little restaurant which we had breakfast all together in the next morning. There was even a quite little grassed area with water feature where we gathered but there was only one seat - the only downside. Bed was comfy, enough space for QS & 2 singles in our upstairs family room and a bathroom that looked quite modern, given the age of the motel. The corner shower was however a teensy bit squeezy so not very suitable for the tall & even slightly wide. Overall very happy with our stay & the extremely accommodating staff. It made our family trip even better. Though its location is a bit far from the city, the apartment was better than expected. Westfield is nearby and it has a good kitchen so we could cook ourselves. Staff were helpful and friendly. More importantly, the price was quite reasonable. 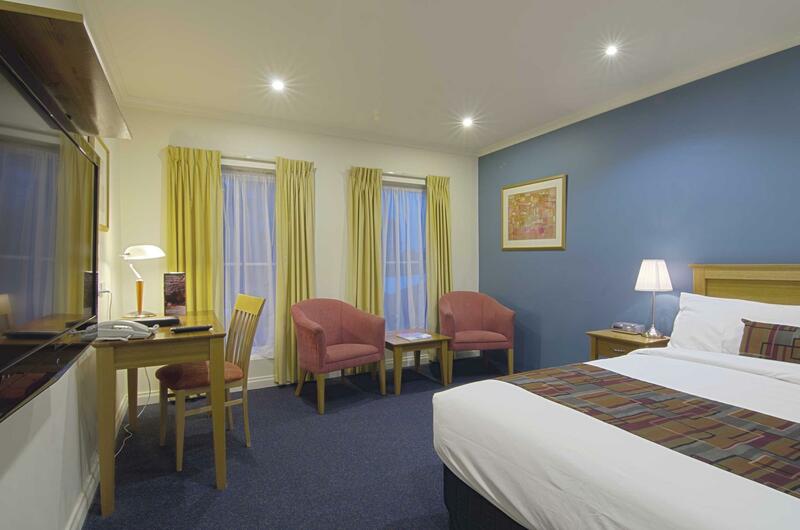 We are a family of 2 adults and 2 kids staying at the family room with a double bed and 2 single beds. The room is clean, comfortable and all our family members loved it. The best of all is the complimentary wifi which is fast and free. 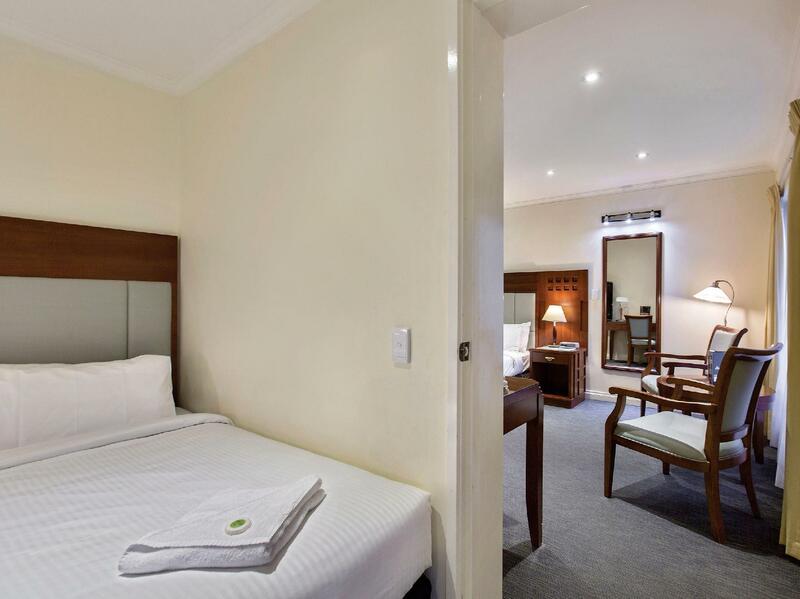 The only drawbacks are the hotel is too far away from Melbourne CBD, probably that's why it has all those good features with competitive price. Also the wall is kinda thin, so if you have a noisy neighour it will be trouble. We have just stayed in a two bed unit which suited our needs perfectly. Don't let the 80's look put you off. The hotels is updating many of their rooms at the moment. It is mainly a conference type hotel but location close to shops and cafes would suit many travellers. The staff are friendly but the bar and restuarunt could do with a bit of TLC. My friend and I arrived on the evening for checkin and enquired if there were two single bed instead of a single queen bed. The receptionist pleasantly surprised us with a complimentary upgrade to a Family Room. The location was good for us as we were there to visit a friend around Highett. However, cleanliness of the room can be improved. On our first night, we found some crisps on the carpet floor not vacuumed away. Pillow cases on both beds had a few strands of hair. The rubber surface of the hair dryer was so old that it was sticky and tacky. Checkout was easy as we did not consume anything from the minibar or had any meal service. However, few days later, I found that the hotel had charged AUD4.50 to my card. I emailed the hotel and they replied that we were charged for a lemonade. I emailed back to inform that we had informed the receptionist during checkout that we did not consume anything. They replied that they will refund back to my card. While they had resolved the issue, it was still an unnecessary alarm and luckily it was a small amount. Expecting more from a 4star hotel. Dear Szeto, Thank you for taking the time to leave your honest opinion, we appreciate all feedback. I am glad to see that your last minute request was easily accommodated at no extra cost for yourself. I am sorry to hear your room was not up to standard, we encourage our guests to contact reception to give us the chance to make your stay as comfortable as possible. As for the minibar, I am so sorry for the confusion. Our cleaners must have misreported this to us. However I am glad you emailed and got your refund back as soon as we could. I hope you provide us with the chance to give you a superior experience in future. Kind Regards, Front Office Management. Upgrade on arrival, spa suite was clean and spacious, room serviced daily. Easy check in and check out. Close to shopping centre. Staff friendly and helpful. Cons: wifi drop outs made it unusable. 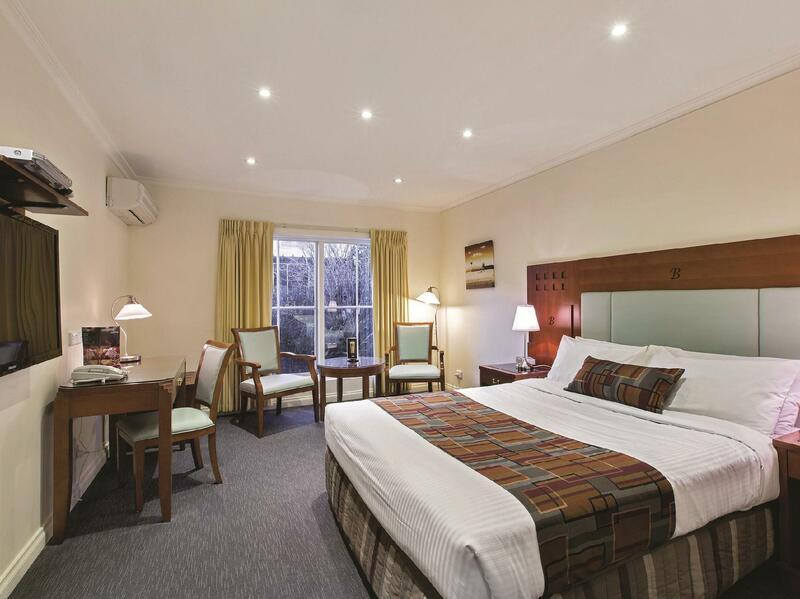 Coming from a regional area we often need accommodation for a team of 3 to play in golf events at Melbourne sandbelt courses. Very well located and meals are very good. Comfortable, quiet and safe parking. Staff friendly and reasonable prices. Dear Vicki, Thank you for taking the time to leave your honest opinion, we appreciate all feedback. It is good to see you enjoy your stay with us and the location of our property suits where you need to go. We always look forward to welcoming our golf ladies. We look forward to welcoming you in the future. Kind Regards, Front Office Management. went to Melbourne so i could take my 87 y/o mum to different medical appointments and do a few things around her house. have stayed here before and its always been good.lovely staff, also very central and easy access to to shopping centres. enjoyed my stay, and it certainly wont be my last. Could tell that the house unit with spacious front porch was well-maintained and made for an enjoyable stay. Signages to show location of this Best Western facility could perhaps be made more prominent to be seen from both sides of Nepean Highway. Moving around was not difficult whether to Melbourne city area or east to Yarra or down to Philip Island. Perhaps clear operating instructions could be printed and pasted on the wall next to the TV and the heating / airconditioning units; so that Best Western could avoid subjecting a less gadget-savvy user to spoil the gadgets. Best Western could perhaps afford maintenance staff to make quick functional check of house units before each new stay; the phone and the remote controls were not working when we moved in. Flew to Melbourne to 'play taxi' to my 86 y/o aunt, normally i have family with me so we stay near Docklands. First ever time i stayed out of the city. Oh...heaven sent. No city traffic etc... The Buckingham has a good location, shopping centre just up the road, awesome. Right on Nepean hwy so very handy. My room over looked the hwy but the double windows..great idea. No noise at all. will definitely stay again. We stayed here for two nights in a standard queen room and were pleasantly surprised with our accomodation. 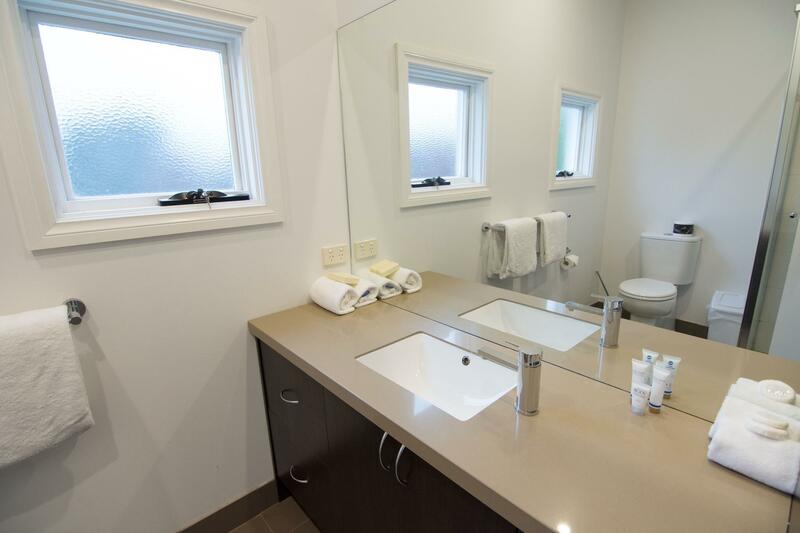 The room was spacious and the bathroom was modern and spotless. The grounds were immaculate. .Despite being on a major road, there was no traffic noise. Breakfast was included in our package and was fresh and tasty. Went to visit Melbourne with wife and 3 kids and all we can say with the hotel was excellent. Close to Westfield Southland at Nepean Highway, 19 minutes to St. Kilda, Aquarium and 5 minutes to one of my auntie. Accessable and quiet. This was an OK motel (not a hotel) but the location left a little to be desired. I wasn't really sure if we were even still in Adelaide . . . ahem . . . er . . . I mean Melbourne. The taxi ride from the airport took us through 3 different time zones. It was interesting to hear two 60-year olds asking the driver several times, "Are we there yet?"